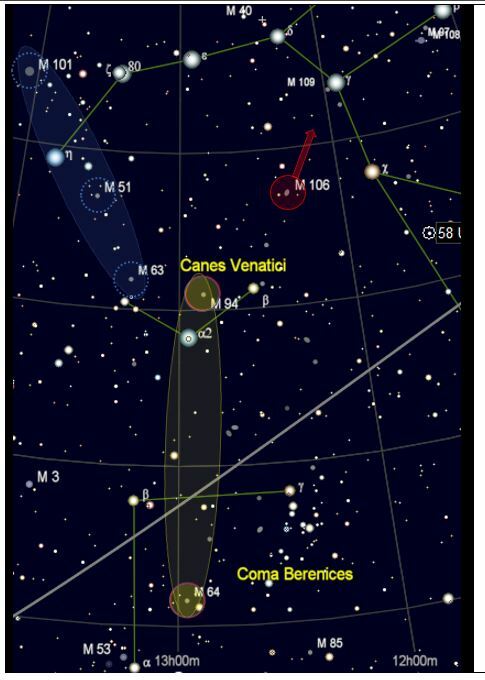 The CVn I Association is a loose assembly of galaxies seen in the foreground (~15 Mly) on the night sky in Canes Venatici and Coma Berenices; In that respect it is very much like the M101 Association, both being extended and weakly bound galaxy group assemblies close to our own Local Galaxy Group (with the Andromeda and Milky Way spirals), and all located on the outskirts of the Virgo Supercluster attractor. 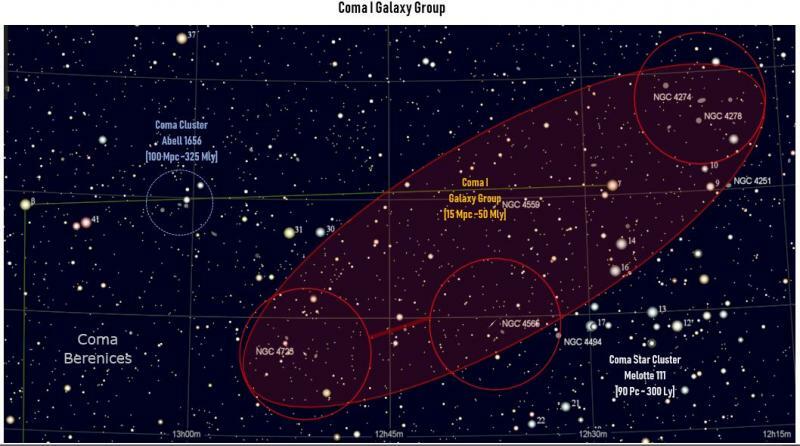 The main gravitational centers of the CVn I association are the M94 (Croc’s Eye) Galaxy Group with 7 members, plus the smaller (4-member) and more isolated M64 (Black Eye) Galaxy Group. 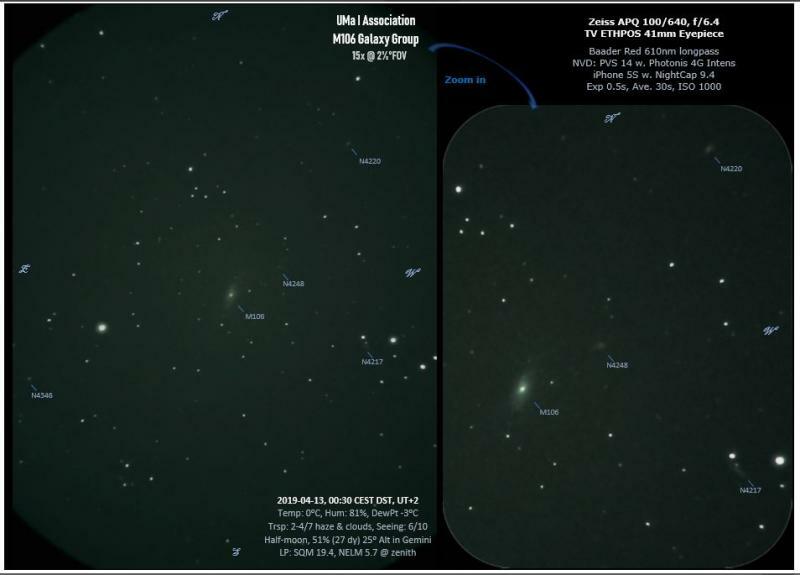 The M106 Galaxy Group was previously often listed as belonging to the CVn I association, but it is now classified in the more distant (~30 Mly) CVn II subgroup, which is best seen as a member of the large Ursa Major galaxy supergroup (more on this later). I start my sweep of the CVn I galaxy association with the M94 (N4736) Galaxy Group in CVn. M94 is a face-on SA spiral with a bright elliptical nucleus embedded in an inner starburst ring inside a pair of faint outer spiral arm. This unusual “eye” structure is probably caused by resonance from the large active nucleus. 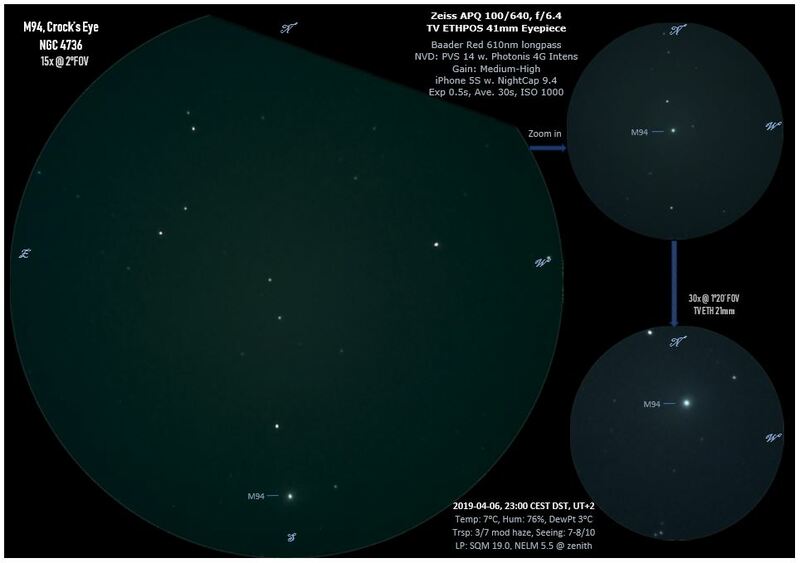 In my 4” refractor at 16x (TV 41 PAN+IIT) I see M94 as a bright stellar core in a faint outer hazy halo; At higher magnification of 30x (TV21 ETH+IIT) I can detect the E-W orientation of the inner starburst ring as an elliptical nebulosity around the galaxy core (but I see no hints of the faint outer spiral structure). The M94 GG contains 6 smaller companion galaxies, including the type IB irregular Magellanic dwarf NGC 4449, also known as “The Box” galaxy. N4449 is located 5⁰ NW from M94 on our night sky, so it’s a good deal outside the 2⁰ FOV of my 41mm PAN wide field eyepiece tonight; I have however described an observation of this object (136x live video) here: https://www.cloudyni...3#entry7862392. I’m switching my focus now from the nearby [5 Mpc ~ 15 Mly] galaxy groups in UMa and CVn (M101 & M94), to groups at a medium distance of around 15 Mpc ~ 50 Mly, namely: Coma I and UMa I. 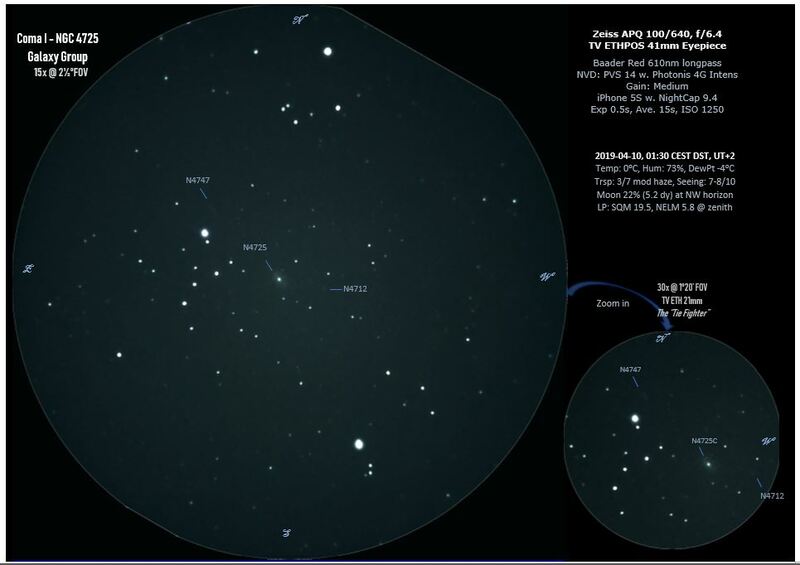 These groups are still part of the Local Sheet “Spring Milky Way of Galaxies” along the Supergalactic equator, albeit outlying and in the background at around the same distance from our Local Group as the Virgo Cluster. 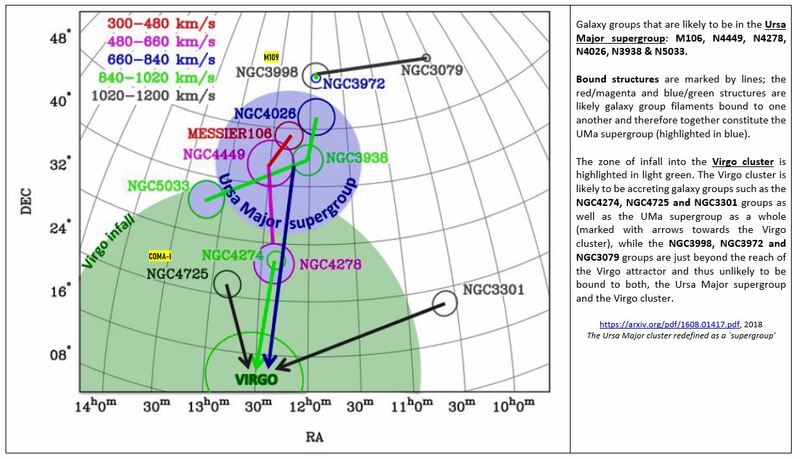 All the galaxy groups mentioned here are currently infalling into the Virgo Cluster, and will eventually merge with it. The Coma I Galaxy Group features many young spiral galaxies, with only three interspersed ellipticals/lenticulars. The group has two main gravitational centers: a dense subgroup centered on N4274/78, plus a looser subgroup surrounding N4565 and including the galaxies around the bright N4725/47. The first subgroup features three prominent almost face-on SB barred spiral galaxies (N4274, 4245, 4314) plus one bright E1-2 elliptical (N4278). All are well seen in my 4” refractor at 15x magnification (TV 41 PAN+IIT). The brighter nucleus and main orientation of the spiral discs are clearly observed (SE-NW), but I can’t detect that all three are ring galaxies (caused by Lindblad resonance in their barred discs). The elliptical galaxy to the S of the spirals shows up as a bright but fuzzy star. It is known to have an active core (AGN) with a supermassive black hole at the center; Much like M87 in Virgo, the black hole has an accretion disc shooting out two jets, but in N4278 the jets are relatively small (1½ pc) and only visible in radio emission. I'm not a big galaxy fan, but I am really enjoying this. One of the key differences is that I have been treating these as discrete objects with no thought of the context, whereas you are mentally putting them into 3D space, or a "landscape" view. While I flagged five Coma objects that had high visual appeal, I think I am going to go back and try this your way. Yes indeed, context and wide field is what I'm aiming at with my observations in this "Rich Field" thread! Observing the objects with proper structural and evolutionary perspective, stepwise widening the view from co-moving star groups (streams) in our close solar environment, to ever larger structures of star-forming regions (OB-associations) in their shrouds of interstellar molecular clouds (EM/RN/DN, in shells and bubbles), to stellar streams and star clouds in the Milky Way spurs and arms. And further out to the galactic groups and associations, from our Local Cluster with its surrounding galaxy groups in the Local Sheet and filaments to the Virgo Supercluster and still further out to "The Kingdom far, far away", with large Voids pushing out distant galaxy groups into Walls and Filaments. The great picture. The second subgroup around N4565 includes 3 NGC galaxies plus 6 smaller members. 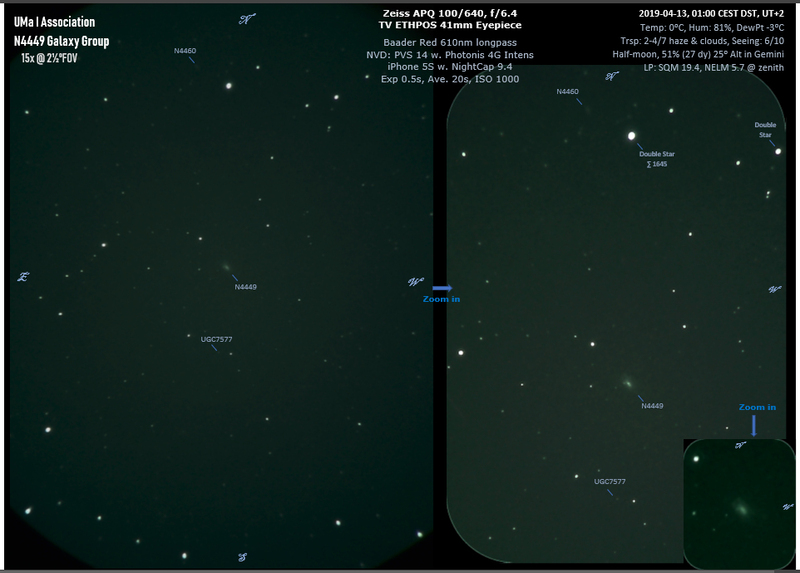 As seen in my 4” refractor, N4565 is a beautiful edge-on SA spindle (the “Needle” or “Flying Saucer” galaxy) with a bright central bulge (I was not able to resolve the dark dust band in front of the galaxy nucleus though). I can see the core of the type E1-2 group member N4494 E of N4565 as a hazy star, while the faint companion N4562 (aka N4565A) is just beyond the resolution of my setup tonight. 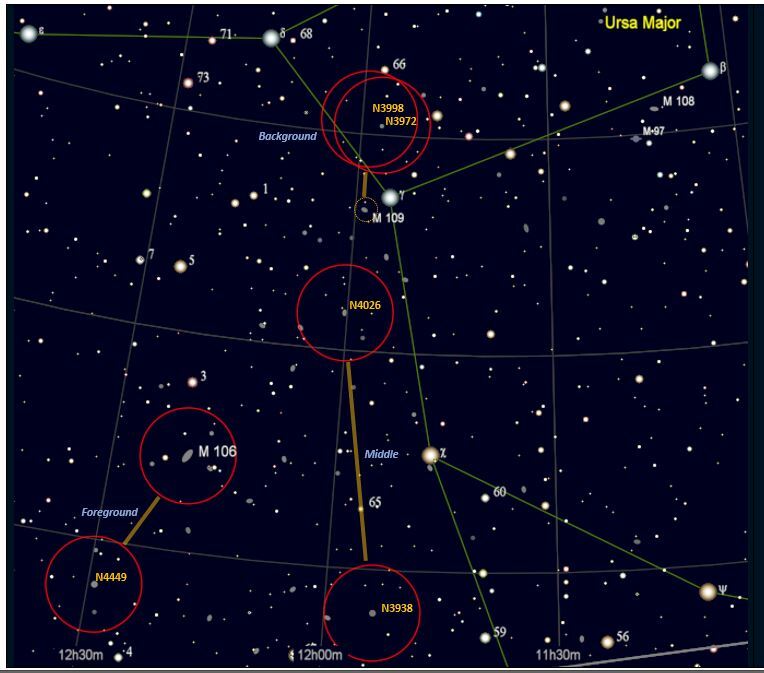 The second subgroup around N4725 resides in a beautiful star field, with N4725 at the center of a large triangle of ~7m stars plus several chains of still bright 9-10m stars. N4725 is a peculiar SAB mixed giant spiral that shows a very bright central core with a bar encircled by a prominent starburst ring. The galaxy disc is tilted ~45⁰ from face-on, so the stellar ring shows up brightest where we’re looking through the peripheral “bending” part of the ring (giving the galaxy the look of Darth Vader’s two-winged Tie Fighter from Star Wars!). To the NE of N4725 is seen the faint streak of the smaller edge-on SB spiral N4747 companion galaxy. The two galaxies are an interacting pair, where gravitational pull has warped the disc of N4747 and pulled out gas into three tidal tails, whereas the close encounter has left N4725 with an active Seyfert nucleus and only one circular galaxy arm. Close by N2725 to the E, I can just with some effort glimpse the small spiral companion N4712. Edited by AllanDystrup, 16 April 2019 - 11:17 PM. The Virgo Cluster is large, very massive with high velocity spread (730 Kpc, 1.2*1015 Msun, 715 Km/s). It contains a mix of early ellipticals in the core surrounded by late-type spiral galaxies. 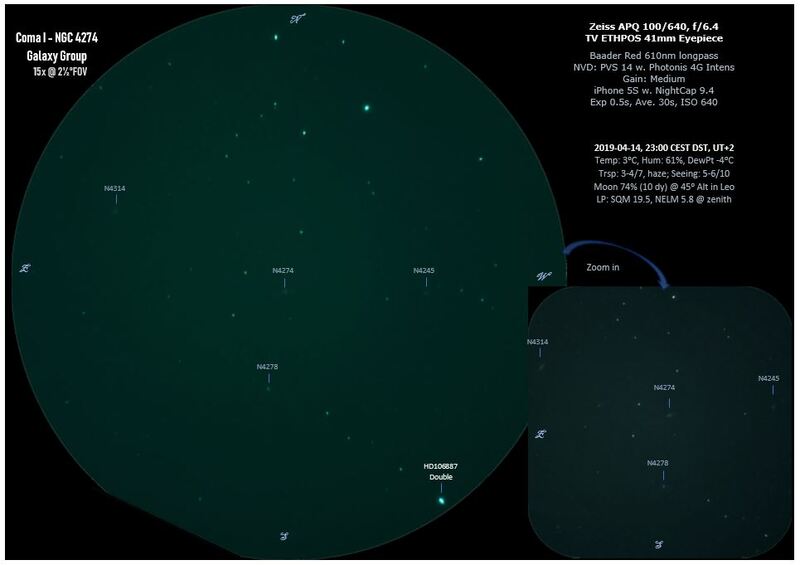 The Virgo cluster is likely accreting the Ursa Major supergroup (UMa I) as well as the N4274, N4725 (Coma I) and N3301 groups, all marked with arrows towards the Virgo attractor. The background plus the N3938 groups are unlikely to be bound to either the UMa supergroup or the Virgo cluster. As seen on the night sky from our Milky Way, the nearest galaxy groups (M106, N4449) are located towards the SE in UMa, the intermediate distance groups (N4026, N3938) are a little more towards the W close to χ Uma , while the groups in the background (N3998, N3972) are in the area up N around γ Uma (Phecda). I’m out as usual these starry spring nights, with my 4” refractor plus a 41-PAN eyepiece. We’re in the middle of April in the middle of the night (2019-04-13, 00:30 CEST, DST UT+2), and both transparency and seeing are also roughly “in the middle” of the scale: Trsp. varying ~2-4/7 with rags of drifting stratus clouds, Seeing calm 6/10 with a medium Temp 0⁰C and Humidity 81% (DewPt at -3⁰C), the Moon is close to half (53%/8dy) at 25⁰ Alt. in Gemini, and the LP is (surprise!) halfway between city and rural, i.e. suburban at NELM 5.7 (SQM 19.4). 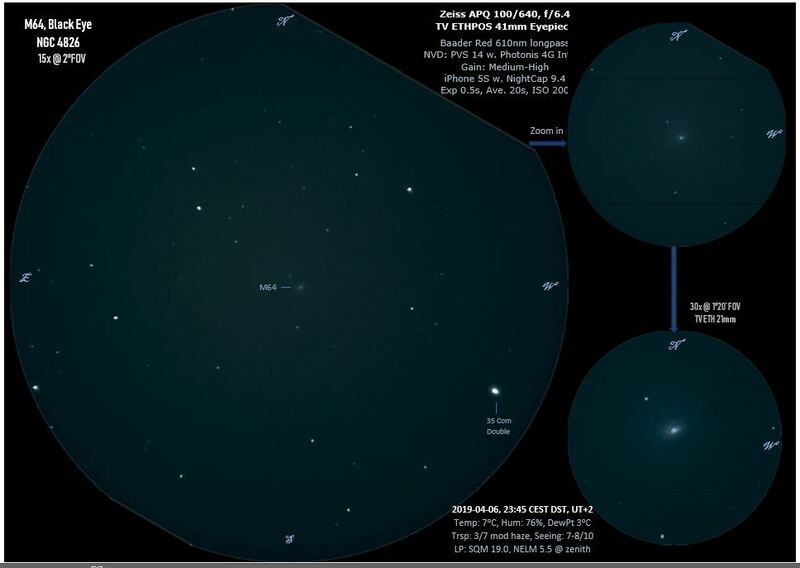 I start my sweep of the Ursa Major I galaxy groups (the UMa Association) with 1: the UMa I groups nearest to our Milky Way: around M106, N4449 and N4278. The M106 galaxy group has the large SAB spiral M106 (N4258) at its gravitational center; The spiral is big and bright in my 4” refractor (using 41Pan + IIT); I can see a luminous stellar core in a highly inclined disc (~20⁰ from edge-on). The disc features two large spiral arms, the bright and broad base of which is easily detected, bending up NW and down SE, giving the disc the look of a warped figure “S”. M106 has an active galactic nucleus (AGN) with a supermassive black hole that has an accretion disc, which emits both microwave laser radiation (masers) as well as a pair of jets. The jets in turn heat up the gas in the disc, so that a pair of extra “arms” can be seen arching out above and below the galactic plane (in high resolution photography, alas NOT in my 4” refractor...). The edge-on spiral galaxy N4217 seen WSW of M106 is a probable companion to the large M106 spiral; It is observed as a thin sliver of light, that is somewhat dimmed by the dust band of the spiral arms. N4248 is a close by dwarf irregular spiral companion to M106, that has probably been perturbed by interaction with its neighbor. N4220 is a SA spiral galaxy to the NW of M106, while N4346 is a S0 lenticular in the opposite direction to the SE of M106. 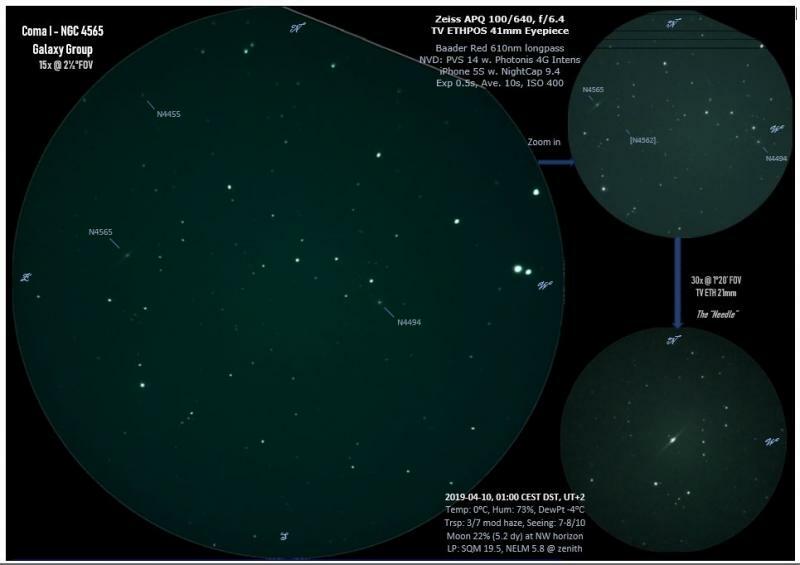 Both N4220 & N4346 are members of the near (southern) UMa I groups, and they are are clearly observed in my 4” refractor, including the general orientation of their galaxy discs plus their brighter nuclei; Further details of arms and dust bands in these smaller galaxies are however beyond reach of my setup tonight. Edited by AllanDystrup, Yesterday, 02:32 AM. Continuing with the UMa I groups nearest to our Milky Way, I now move on to the N4449 Galaxy Group. N4449 (also known as the “Box Galaxy”) is an irregular type-SB Magellanic dwarf galaxy, seen tilted 43⁰ from face-on. The Box contains many HII regions with associated OB-associations, most concentrated at the NE end, which appears as brighter knots in my 4” refractor. The high rate of star-formation in N4449 is probably caused by a previous merger with another dwarf galaxy. The companion N4460 is an interesting SB0 barred spiral galaxy found a little NE of the double star Struve-1645. It is surrounded by an extended faint nebulosity (best seen in astro images), which is caused by gas outflow from stellar winds created by supernovae and OB-associations in the circumnuclear region. PS: I've described my observations of The Box dwarf galaxy using glass-only and EAA in this and the following post: https://www.cloudyni...-ngc/?p=7862388. Edited by AllanDystrup, Today, 02:03 AM.